Reduces foot and lower body fatigue. Keep feet cooler and drier. For high heel footwear and sandals. Clear gel half insoles that cushions the ball of the foot. Non slip grip to stay firmly in place. 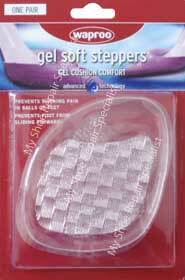 Ideal for all foot types Made from 100% gel . Cushions the ball of the foot. Prevents foot from sliding forward. Loose shoes fit better. Superior shock absorption. Washable. great for shoes that are a little loose.